Untrammeled by man—that was a key phrase in the Wilderness Act, which established the national wilderness system just over 40 years ago, before genderinclusive language gained currency. 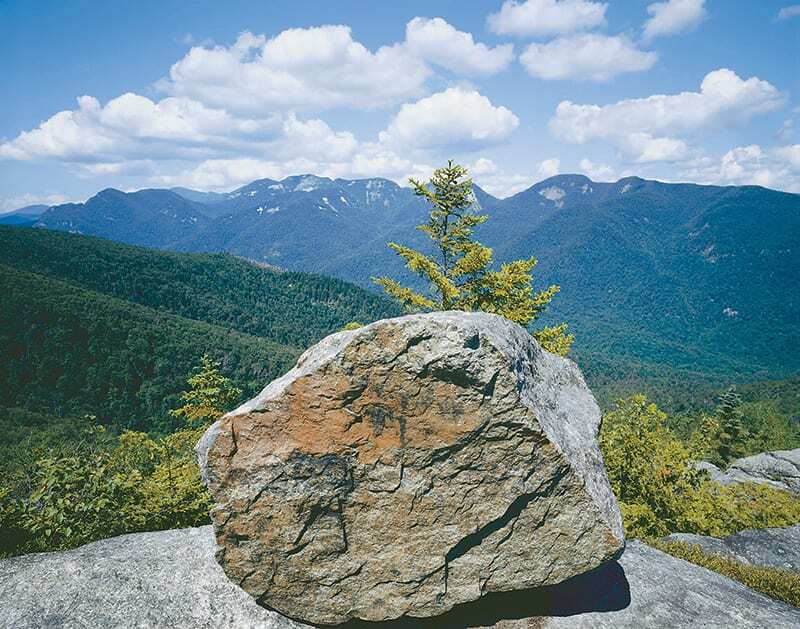 (Incidentally, the man who coined it, Howard Zahniser, was heavily influenced in his thinking by his experiences in the Adirondacks.) It’s also a phrase that could aptly characterize the sense one gets from perusing Nathan Farb’s much-anticipated new book, Adirondack Wilderness. There isn’t much evidence of trammeling by anybody. Actually, it’s not quite that simple. 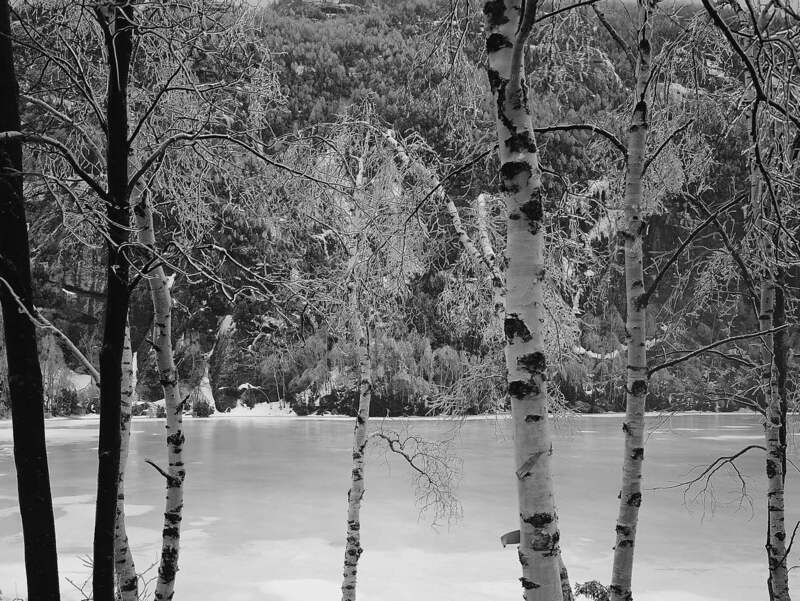 The fact that the Adirondack wilderness exists today is largely the result of human intervention and our impulse to salvage it over many decades. Much of the now-wild nature that we see in Farb’s book has at one time or another been abused, sometimes rather badly. 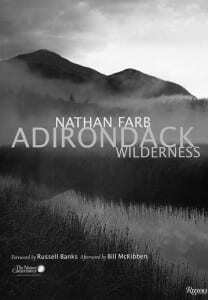 Because the author recognizes the role people have played in the Adirondacks, this is more than a coffee-table picture book that you leave lying around to impress your visitors. It is a paean not only to the protection of wilderness, but also to its restoration: In his afterword, writer Bill McKibben calls the Adirondacks “arguably the most important experiment in nature conservation anywhere on the planet.” Those who contend that the state Adirondack Park Agency has abdicated its responsibility to safeguard the natural environment from creeping development may take issue with that notion. Quibbles aside, the Park has been a laboratory for mixing the human with the wild, and it continues to inspire artists like Farb. There’s no need to talk about his technical ability; it goes without saying. It’s the artistry that stands out. 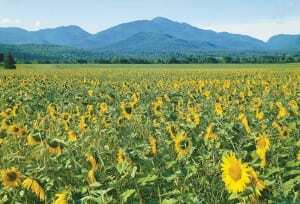 Often called the Ansel Adams of the Adirondacks, Farb has a knack for finding a fascinating detail in an expansive panorama and conveying the worth of both. One may see the world in a grain of sand, said William Blake, and Farb shows us the truth in that. Like the Hudson River School painters of the 1800s, he can find beauty and order in the apparent chaos of nature, and when he doesn’t, that’s OK too—see, for example, his ice-storm pictures. 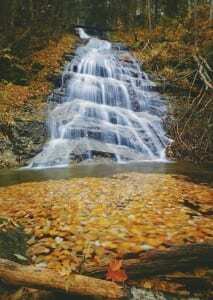 Farb has a way of making mist and fog look as though they ought to lift right off the page, his streams and waterfalls as though they will start to flow at any moment—I want to avoid getting wet as I study them. I feel compelled to sniff some pages to see if the flowers emanate an aroma. His bunchberries on the forest floor are delicate but tough, his cardinal flowers radiant; his lily pads—there are hundreds of them throughout this book—seem ready to part before the prow of my canoe. blazing maple in the approximate center. Near it, a single conifer on a boggy island has caught the full light of the sun. 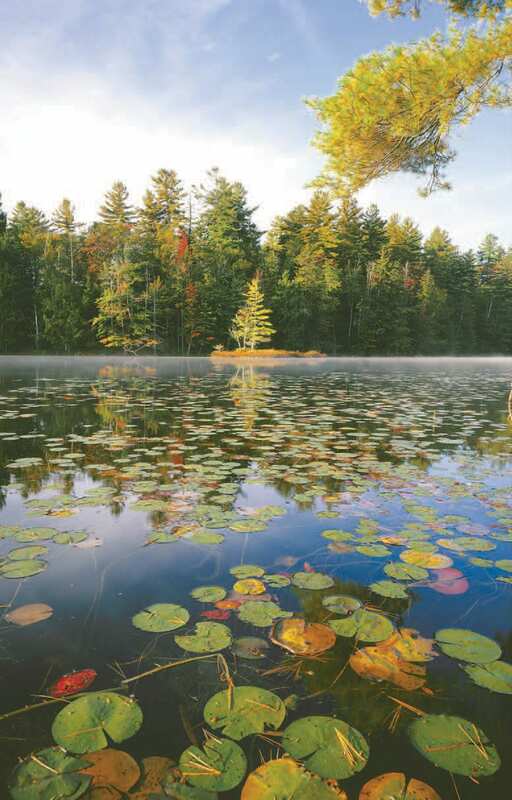 The reflection of the trees on the water is mottled by the lily pads, tying the image back to the first thing that caught the eye, in a great circle. 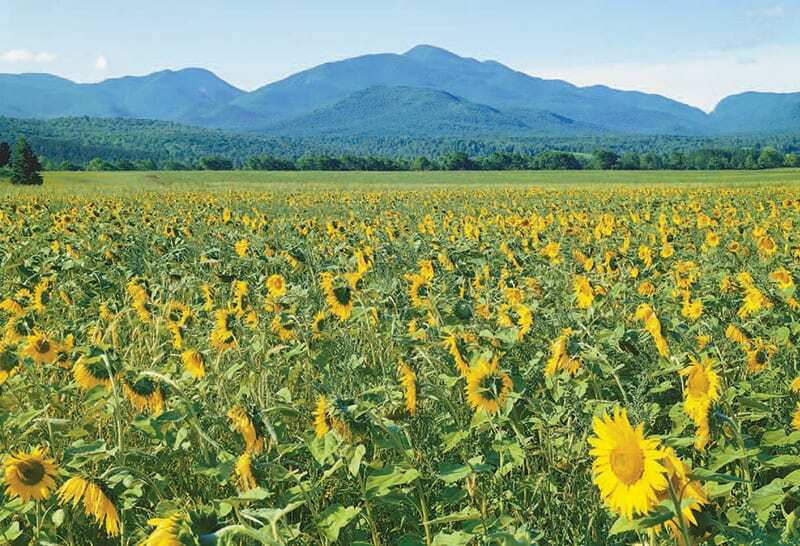 Farb uses this spotcolor technique frequently, as in “View from Baxter Mountain,” wherein a touch of red ground cover in the foreground accentuates the quilt of greens that dominates the rest of the scene. Some of the images are accompanied by Farb’s commentary about them; others are details of larger images in the book. When a particular scene gets both treatments, it’s shot of Glasby Pond, in the Five Ponds Wilderness of the northwestern Adirondacks, and on a detail of that shot. 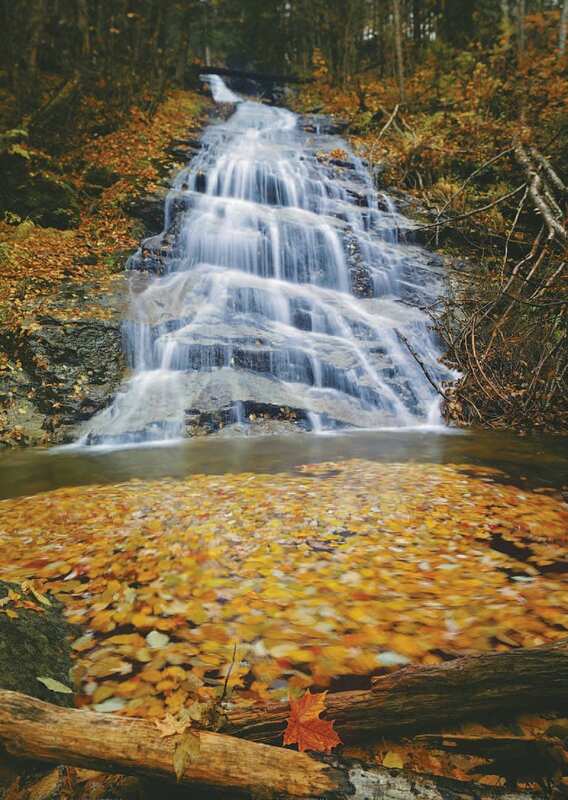 Noting that the famed wilderness advocate Bob Marshall found the area devastated by the effects of logging in 1922, Farb tells us “the forest has since returned in a remarkable demonstration of nature’s resilience when left to its own devices. Beavers, as agents of nature, are changing the area from forest to wetland,” with an attendant revolution of species. 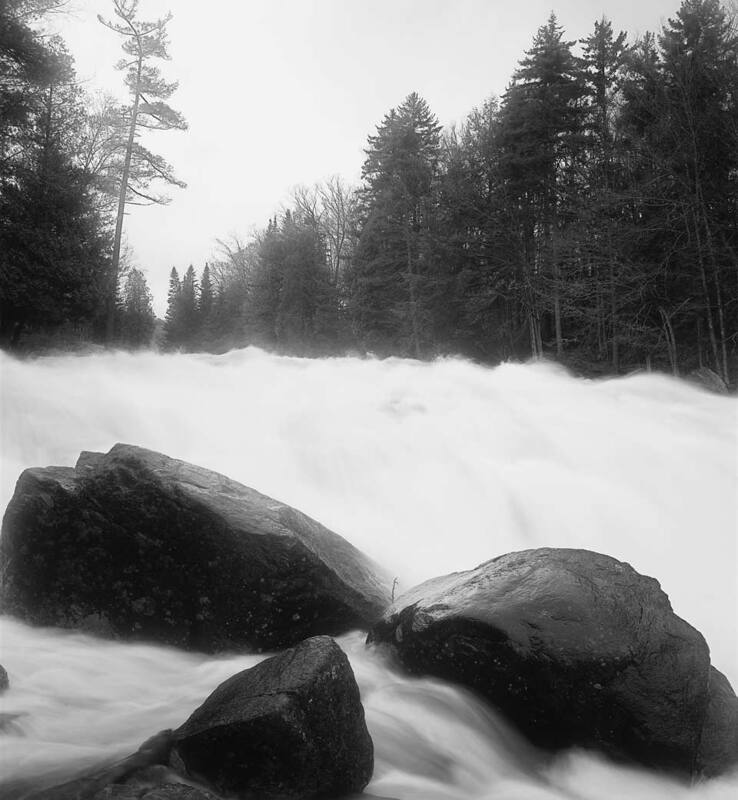 “The hemlock and spruce saplings growing on stones and hummocks are profiting from the open canopy, but only time will tell if they grow to maturity or are killed by flooding.” So it is in nature—what appears static is in fact in constant flux. In addition to McKibben, two other writers contributed to this book. In his foreword, novelist and Adirondack resident Russell Banks furthers the contention that what we have here is more than mere pretty pictures of nature: “In these images, layers and levels of concrete and spiritual reality grind constantly against one another.” The images “invite us to contemplate the whole of Creation, to meditate on the spiritual paradox of its irreducible complexity and infinite simplicity.” Notes by naturalist Jerry Jenkins, provided with the assistance of the Adirondack Nature Conservancy, help give context to many of the images. 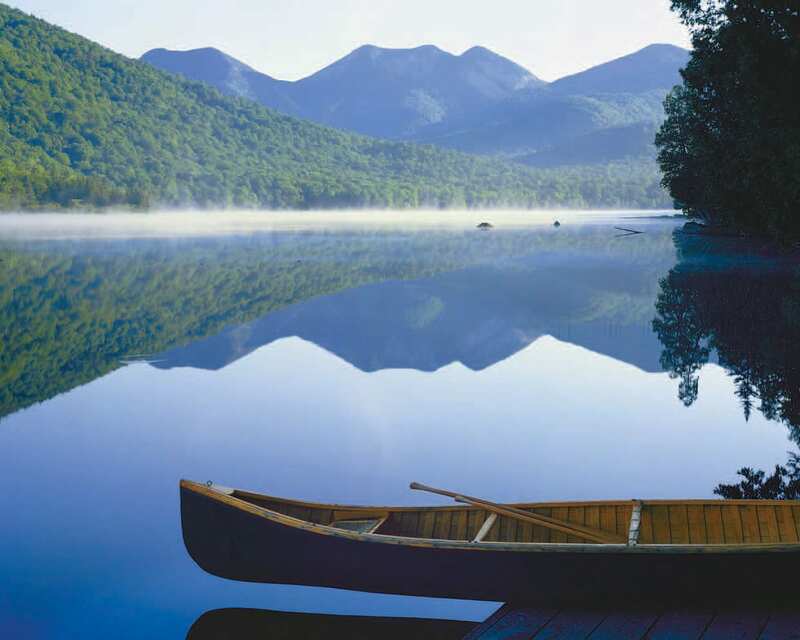 Fewer than a half-dozen of the 105 images show human artifacts (guideboats, the ski trails on Whiteface, Adirondack chairs, a lakeside canoe, an old wire fence), though not humans themselves. The only picture in which you actually see people is in the afterward: it shows a billboard-size Farb photo of Upper Ausable Lake overlooking a bustling Times Square, blurry with people and taxis and buses. This is, worth a few minutes. In the short essay “A Dynamic Landscape,” Farb ruminates on a writes McKibben, “a reminder of deeper connections than we can almost articulate.” Farb addresses this theme himself, both in his touching essay “A Natural Connectivity,” accompanying a view of the shoreline of Handsome Pond, which lies in a tract of land that will one day offer access to disabled persons, and in his introduction, which is part autobiography, part philosophical tract. There, we see a picture of the rock named “Adirondack” on Mars—a symbol, Farb suggests, of the notion that connectivity extends farther than we can grasp with mere pictures and words.